Heyhey, the other day I received a whole bunch of Shimmer's glittery goodness. 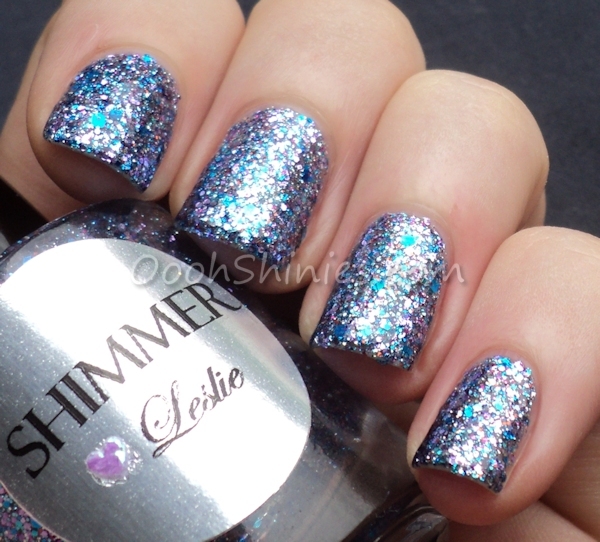 If you love glitters, read on! :) These polishes have an insane amount of different colored, mainly smaller glitters, and they combine into real glitterbombs. I wasn't sure how to swatch these polishes, on their own, layered, layered on different colors, or as sponged glitter tips. I'd wear them on the tips I think, simply because these polishes feel so perfect for that! But I decided to just go for the polish on itself for my swatches, as you can see, they cover well enough for that too! Today I have the first 3 for you, I used 3 coats of each polish and 1 coat of top coat. To get a really smooth effect I'd use another coat, but they don't look bad without top coat either. I'll have to try them matte sometime as well! They applied easy, I applied the first coat gently, after that I could just polish them on as always, no dabbing or fishing needed. 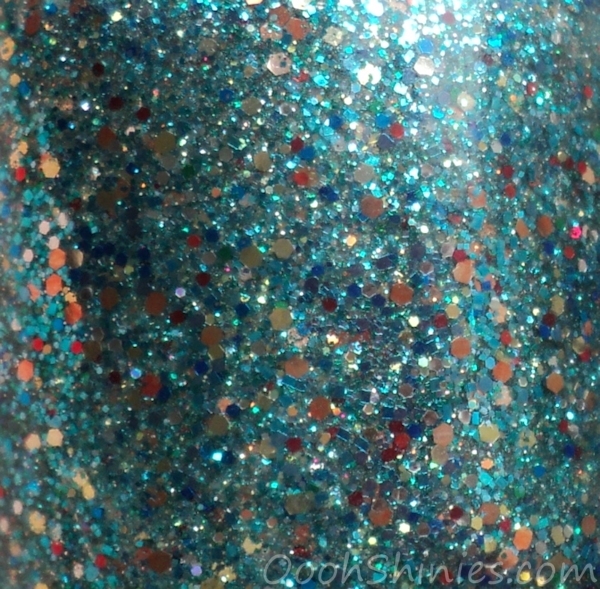 Jasmine is a green/blue glitter polish with a clear base. It's packed with glitter in copper, gold, red, silver and holographic. It also has different colors of green and blue glitters. I might miss some colors here, but these are just that crazy! The glitters are in various shapes and sizes, the copper and golden ones are the largest. Leslie´s main colors are purple and blue in a clear base. I also spot red, holographic, lighter blue and I think silver & pink as well, again in various shapes and sizes. The largest being blue hexagonal glitters. Oh Mary... where to begin! 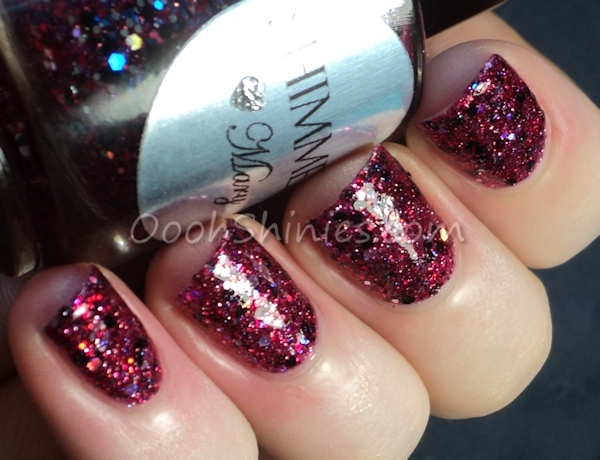 Mary is a berry-red colored base, packed with red, holographic, black and silver glitter. It looks like it has pink as well, and it also has a blue/purple flash in it, but that might just be some holo bits showing like that. I think :P The largest glitters are black and holographic, but this one has various sizes holo glitter.